The University of Washington is moving most of its collection of 9,000 greenhouse plants to a temporary, free greenhouse space, offered by Amazon. What do University of Washington botanists and the online retail giant Amazon.com have in common? 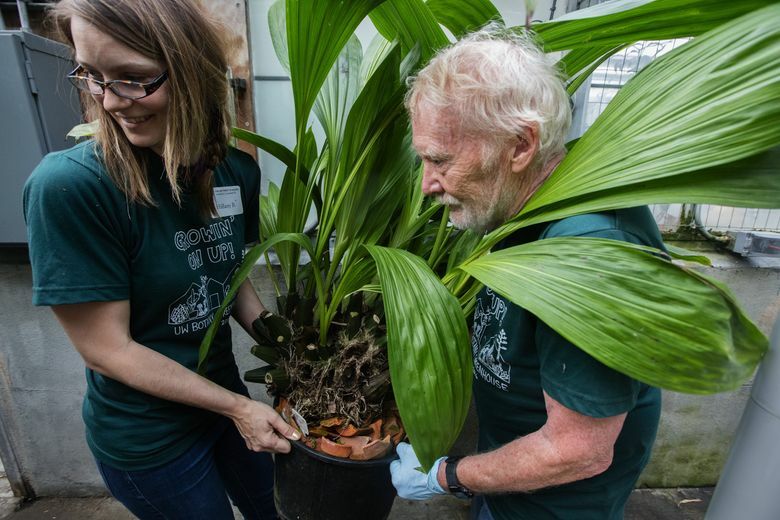 For the next two years, most of the UW’s collection of 3,400 specimens of plants — 9,000 in all — are moving into a Redmond greenhouse once owned by Molbak’s and now offered to the university for free by Amazon. Amazon has greenhouses in Redmond because it’s building a collection of plants to live in its glass-and-steel spheres taking shape in downtown Seattle. 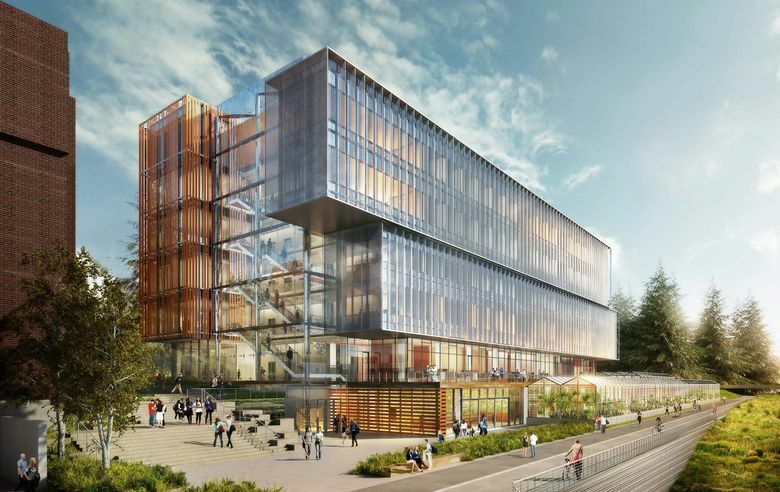 And the UW is building a new, 20,000-square-foot greenhouse as part of its $165 million Life Sciences Building, a five-story, glass-and-steel structure that will go up alongside the Burke-Gilman Trail. 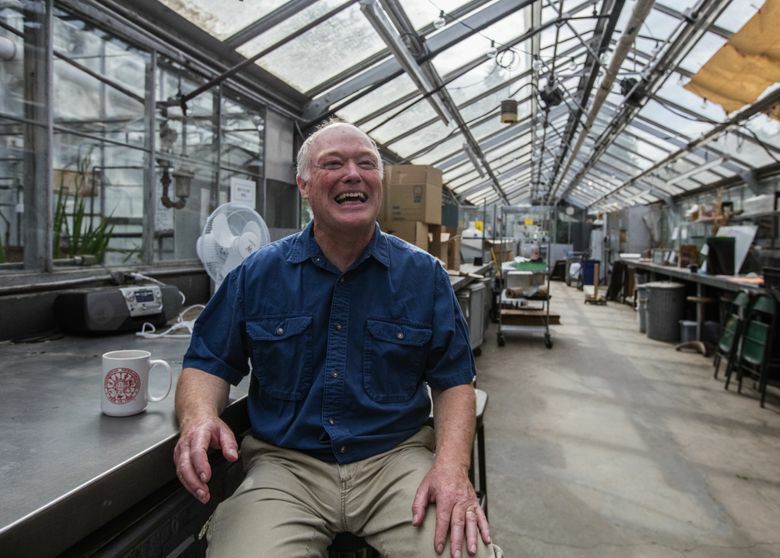 The plants, which live in the 67-year-old Botany Greenhouse, must move because the greenhouse will be razed this summer to make way for the new building. With room, apparently, to spare, Amazon offered the UW free use of a Redmond greenhouse, an in-kind contribution worth more than $200,000, the company says. About 1,000 of the plants will be housed in the UW’s Center for Urban Horticulture. “It was a meeting of minds of plant-oriented people,” said Toby Bradshaw, chair of the Biology Department. Ron Gagliardo, Amazon’s horticulturist, helped arrange the deal that gives the UW free greenhouse space, he said. And Amazon will get some benefit from the arrangement — it will be able to propagate some of the UW’s unique and rare species to grow in its spheres. Tuesday was moving day at the UW greenhouse, and volunteers, including more than a dozen members of the Husky football team, pitched in. “Coming through,” they called out, wheeling trolleys of carnivorous plants, epiphytes and cactuses with little Styrofoam peanuts stuck on their spines. The plants were chosen for the UW greenhouse collection because they are academically interesting, and because they represent a wide diversity of plant species. Bradshaw said the collection represents 1 percent of all plant species in the world. But not for a while. The UW collection will be off-limits to the public during its stay in Redmond. When the new Life Sciences Building opens in fall 2018, the greenhouse doors will again open to the public. The collection includes rare plants like Wollemia nobilis, an Australian conifer thought to be extinct until it was discovered in a valley in 1994. National Geographic researchers propagated the tree and gave one of the offspring to the UW. “Really, it would prefer to be outdoors,” said interim greenhouse manager Jeanette Milne, looking up at the tree that was stretching toward the glass ceiling. When the new building opens, Wollemia nobilis is likely to be planted outside, where it could grow 30 feet tall. The collection also includes Welwitschia mirabilis, or tree tumbo, a plant with big, straplike leaves, native to South Africa, remarkable for its long life span — the plant can grow for 1,000 years — and its ability to survive in an incredibly dry habitat. “These are a conifer, like a Douglas fir or a pine. You’d never guess by looking at something like this that it is related to the Doug fir,” Bradshaw said, pointing to the two thick, broad leaves coming out of a bulbous base. There are the carnivorous plants — the pitcher plant, the cobra lily, the sundew. One of the oddest plants in the collection is Nepenthes lowii, a pitcher plant from Borneo, which produces a sticky white bait that attracts the tree shrew. The bait includes a powerful laxative, and when the shrew eats the bait, it poops in the plant’s bulbous pitcher, providing a shot of nitrogen and other nutrients. “It’s also known as the shrew loo,” Bradshaw said. UW botanists took the plant on a visit to Woodland Park Zoo’s tree shrews, and “The minute they saw it, they ran to the plant and began eating the white goo,” he said. There’s the crowd-pleasing Amorphophallus titanum, or corpse flower — the UW has several of them — a plant that produces a single flower that smells of a rotting corpse. The last time the flower bloomed, Bradshaw said, 4,000 people visited the greenhouse to see it. The Botany Greenhouse was built in 1949 for a professor who wanted to grow corn in Seattle as part of his work on genetics. When that professor later shifted his attention to yeast, the greenhouse languished and fell into disrepair, Bradshaw said. In the early 1980s, it was taken over by UW botanists who began building a collection that spanned the globe. On Tuesday, about two dozen Husky football players helped move plants throughout the morning. They were there at the urging of wide receiver Taelon Parson. A junior majoring in biology, Parson had heard about the need for volunteers with muscle when he was at a Biology Department dinner (he’d been awarded an “excellence in biology” award, along with a scholarship). He offered to get some guys from the football team to help. A few days later, he approached one of the team’s weight trainers. “Can I say something to the guys about plants?” he asked. Parson had to twist a few arms to convince his fellow teammates, but by Tuesday, more than two dozen football players wearing Husky T-shirts and shorts were lifting pots and wheeling trolleys out of the hot greenhouse and into waiting trucks. Parson was dressed for the occasion: Along with his Husky T-shirt and shorts, he wore a pair of flowered socks.